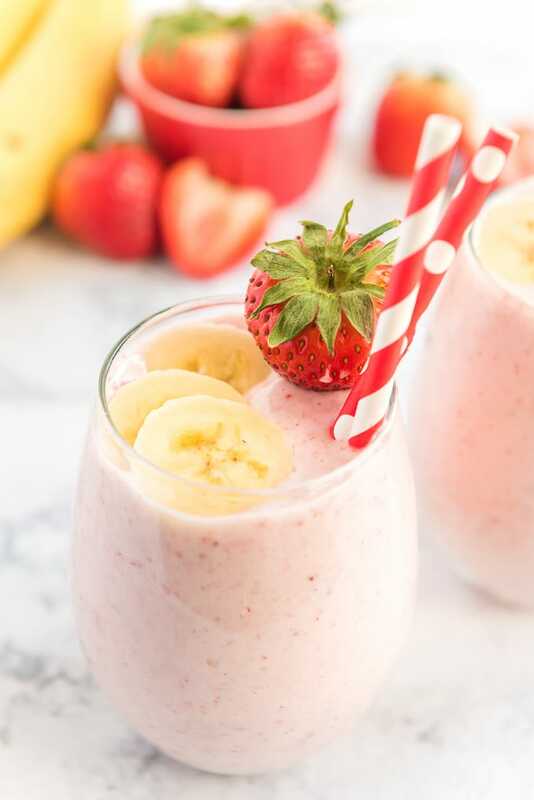 This easy Strawberry Banana Smoothie is made with only 5-ingredients, making this smoothie a quick, healthy and delicious breakfast or snack! This recipe is sponsored by Monk Fruit In The Raw®. 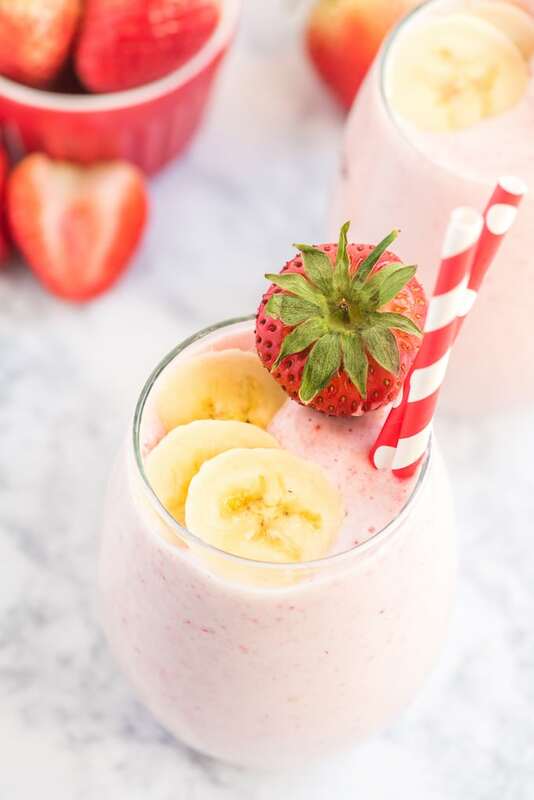 This Strawberry Banana Smoothie is one of the best ways to start the day! 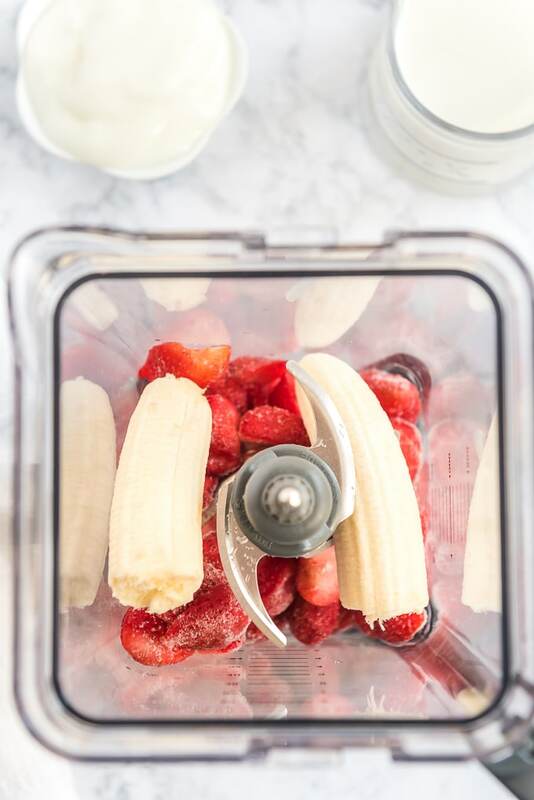 You’ll love the flavor and taste fresh strawberries and bananas blended together. They’re a match made in smoothie heaven! There’s just something about how it’s smooth, cool and frosty to really kick my taste buds into overdrive. And to be perfectly frank, I’ll enjoy a smoothie any time of the day. While I love them for breakfast, I’ve also been known to have one for lunch, dinner or as a healthy snack as well. There aren’t many snacks that truly tickle my tastebuds as smoothies do. The fresh fruit combined with the ice cubes and milk makes this one snack that I crave over and over again. With the summer months literally right around the corner, this smoothie recipe couldn’t happen at a better time. And if you’re a gardener at heart, you’ll know that before long, your homegrown strawberries are going to be in full bloom. 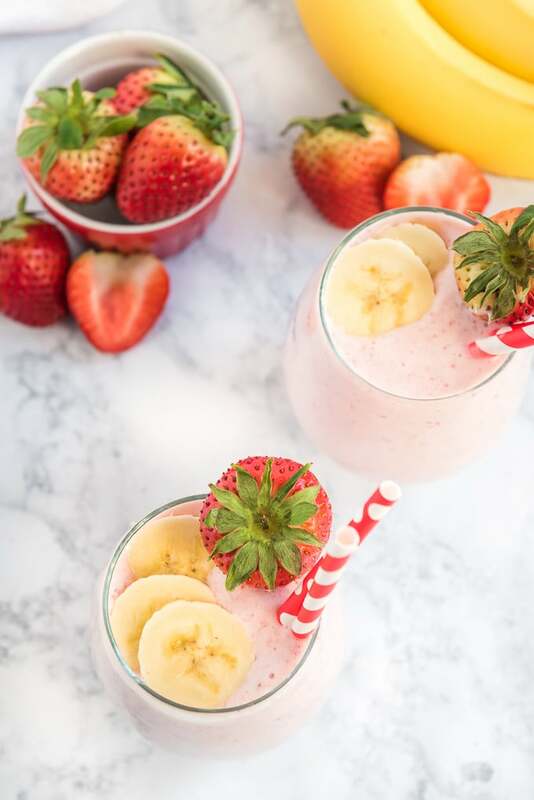 Put them to good use by rocking them with this delicious Strawberry Banana Smoothie recipe! Perfect for summer gatherings, BBQ’s are just as a nice and cool treat after a long hot day. Treat your tastebuds to one smoothie that you’ll never, ever forget! ● STRAWBERRIES: 2 cups of fresh or frozen strawberries. ● BANANA: 1 fresh banana, peeled. ● YOGURT: 1 (6 oz.) container of vanilla or strawberry banana yogurt. ● MILK: 1 cup of milk. You can use cow’s milk or almond milk. 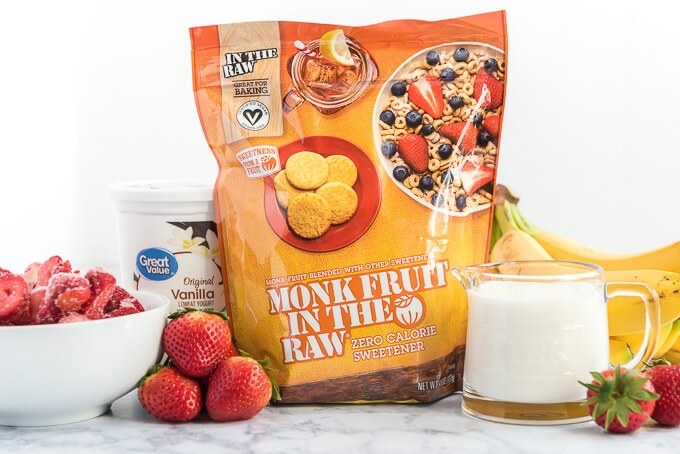 ● MONK FRUIT IN THE RAW® BAKERS BAG: 2 Tablespoons of Monk Fruit In The Raw®. ● ICE CUBES: if you don’t use frozen fruit, I would add a handful of ice cubes. STEP 1: Place all ingredients into a blender. STEP 2: Blend on high for 2 minutes or until smooth. Scrape down sides and blend for another 30 seconds. STEP 3: Serve and enjoy! 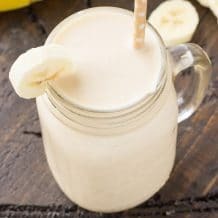 ADD PROTEIN TO KEEP YOU FULL: When I don’t have time to make breakfast, I add my favorite protein powder to this smoothie. I love that I can’t taste the protein powder (I hate the taste of protein powder) but I know it’s there because it keeps me full until lunchtime. REDUCING ADDED SUGAR: By swapping sugar with Monk Fruit In The Raw, you can save up to 700 calories per cup. 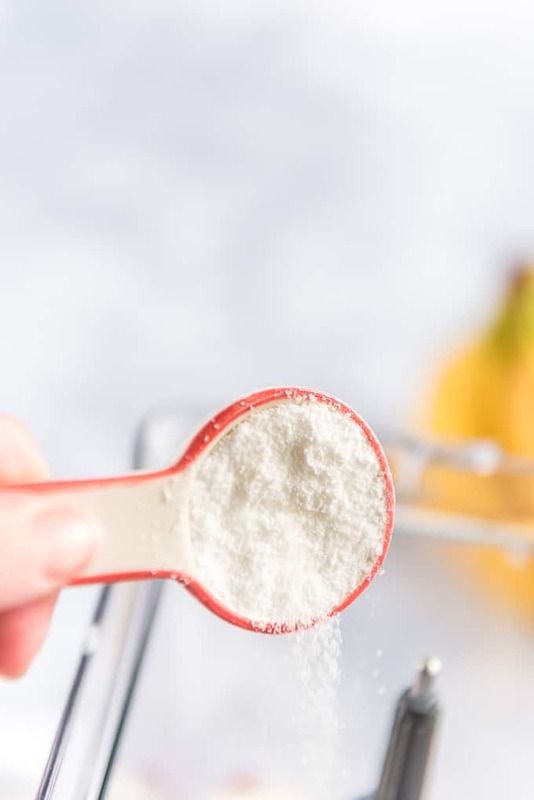 The Monk Fruit In The Raw Bakers Bag measures cup for cup just like sugar making it convenient for adding to smoothies but also great for any baked good. USE FROZEN FRUIT: I like to use frozen fruit instead of ice cubes in my smoothies. Unless it’s the summertime when I love using all the fresh fruit! FILL UP YOUR BLENDER: You always want to layer your ingredients softest to hardest (frozen). First, add the milk, yogurt, Monk Fruit In The Raw®, strawberries, and banana. EXTRA SMOOTHIE LEFTOVER? If you have some leftover smoothie, you can put it in the fridge for later. 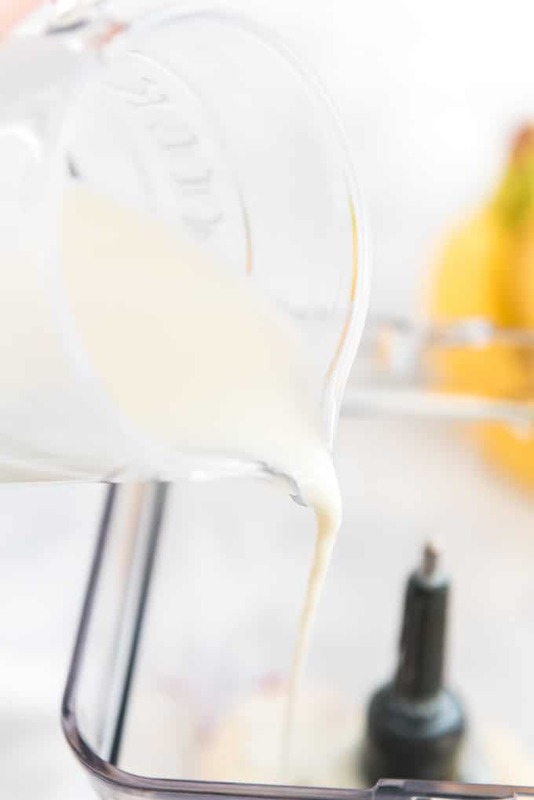 Once you’re ready to drink it, I like to add a little extra yogurt to the smoothie to thicken it up again. 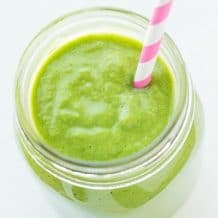 BEST BLENDER FOR MAKING SMOOTHIES: I make smoothies almost every day and I’ve gone through my share of blenders. 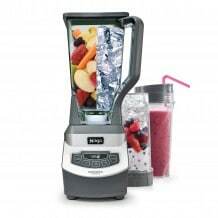 Here is the blender I use every day, it’s fast and makes the best smoothies. Place all ingredients into a blender. Blend until completely smooth. Nothing beats a good smoothie to start or end the day with. This would also work perfectly for an after workout boost. Love! 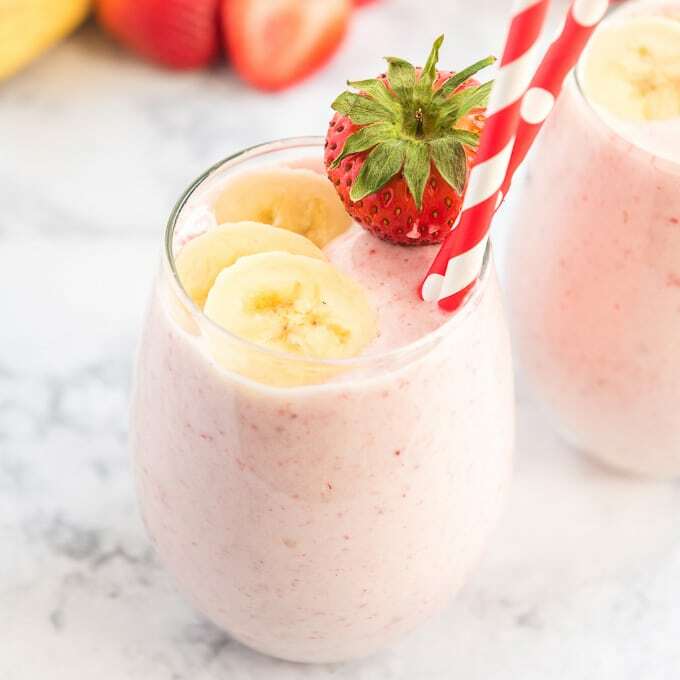 This strawberry banana smoothie looks so fruity and creamy. Perfect for breakfast on the go or for after school snacks. 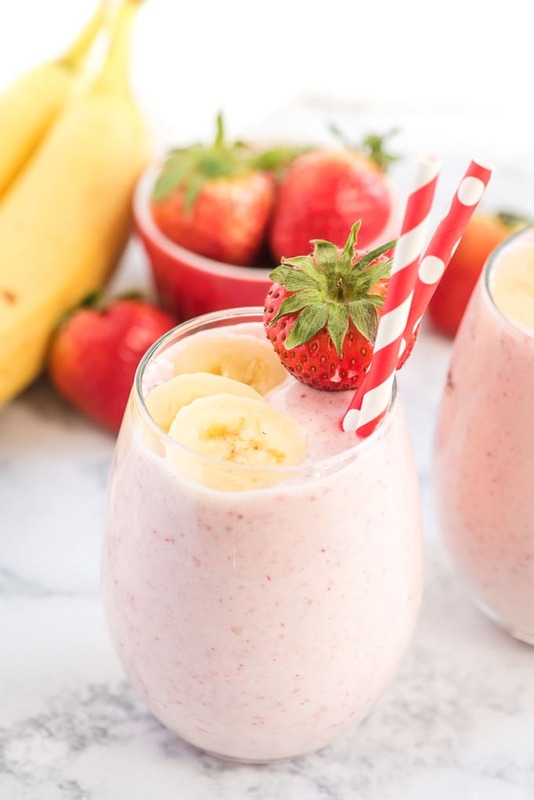 I’d love to start my mornings with a cup of this smoothie.. Easy to make with a burst of strawberries and banana in every sip, sounds perfect !! I love smoothies! They are such a great healthy snack, and my girls love them too. It makes it easy to add some health to their diet. Your smoothie looks extra delicious, I am sure they are going to be thrilled when I make them this! Love the combination of this healthy smoothie. Amazing color and delicious smoothie too. Strawberry and banana is my favourite smoothie combo! They just work so well together and I will never get tired of it! Everything looks so fresh and delicious! We make a ton of smoothies! It’s a great way to get nutrition into my littles. I know they’d be all over this one in particular!! Smoothies are my favorite breakfast! Love the flavors in this recipe! Yummy! 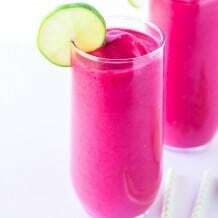 Your smoothie looks so delicious! I love smoothies. Especially the strawberry banana flavored ones. I’ve never heard of that sweetener. I definitely have to find it. There’s no better way to start the day! This will get me up and going! My favorite!! I could have one everyday! My kids love this too! So delicious & easy! The whole family likes to have these for breakfast! These look amazing! Can’t wait to make one for breakfast tomorrow! bananas in smoothies are just the best. this is a great recipe. I wish I grew strawberries so I could have them in bloom! Nothing, and I mean NOTHING beats a classic strawberry banana smoothie. This one is just perfect! My kids will love this smoothie! This flavor combo is a classic for a reason! SO satisfying. My kids really loved it! So delicious! This is one of our favourite easy smoothies to make. We add some cocoa powder too. Strawberries and Banana are one of my fave smoothie combos. This smoothie looks deliciously creamy and tasty. I’ve never heard of Monk Fruit in the Raw, but I will have to check it out!